Securities are tradable financial instruments, such as bonds, shares and derivatives. They generally fall into two categories: debt and equity securities. (More on this in the next Topic.) The US Securities and Exchange Commission (SEC) oversees and regulates the operation of securities markets in the US. It sees that exchanges, brokers, fund managers, and advisors abide by the relevant laws. You can read more about the mission of the SEC here. In the most general sense, all securities represent contracts between two parties. (Sometimes more but rarely.) Bonds, as a debt instrument, reflect a contract between the lender and the borrower: the contract specifies the principal, the interest rate, the length of the loan, and the payment schedule, as well as any special terms such as early payoff. Company shares, as an equity instrument, represent an agreement between the issuing company and the shareholder, for part-ownership in the company in exchange for the purchase price of the stock. Looking at securities and other financial instruments as contracts can be useful, particularly when we look at derivatives, the value of which is derived from, and determined in part by, the value of an underlying security. All securities share two characteristics: they have an expected return, and a risk associated with that return. 2. The “efficient frontier” is the locus (set of points forming a curve) of all combinations of the highest return for a given level of risk. All assets and portfolios of assets lie within the frontier. Any point on the frontier is attainable by combining assets and portfolios, so all frontier portfolios dominate (higher return, lower risk, or both) every portfolio inside the frontier. 3. If an investor is risk averse, they would prefer higher return, and lower risk. Consequently they want to be holding a portfolio on the frontier. But which one depends on individual preferences, risk tolerance, and other factors. a) Higher returns are associated with higher risk. b) By combining assets into portfolios an investor can reach the efficient frontier. 1. If we introduce a riskless asset (yes, that sounds like a theoretical concept more than a practical option,) then it is possible to combine portfolios on the efficient frontier with holdings of the riskless asset to create portfolios that offer more desirable risk/return combinations, depending on the investor’s attitudes to risk. The most likely “riskless asset” is a 90-day Treasury Bill, since it has associated with it very low, and some people would argue effectively zero, risk. It’s probably not perfectly riskless, but practically close enough. The locus (line) of portfolios combining the riskless asset and the portfolio on the efficient frontier is called the Capital Market Line. In most cases the investor will do better by combining the riskless asset into the portfolio, rather than buying only the portfolio on the efficient frontier. Note: In the absence of a riskless asset, the optimal portfolio will be on the Efficient Frontier. Once we introduce the riskless asset then optimal portfolios will exist on the Capital Market Line (CML), which only shares one point with the efficient frontier–M, the so-called market portfolio. Notice that since the efficient frontier is curved (concave) the CML is the set of portfolios with higher returns for the same risk as any point on, or inside the efficient frontier. Consequently a rational investor will always choose a portfolio on the CML. 2. The Capital Asset Pricing Model (CAPM) is essentially a model determining the price of a particular security (more on that in a later topic,) but it is relevant to the discussion of risk and return because it introduces the idea of relative risk. There are many presentations on the web of the CAPM. It’s famous in part because the economists who built it won the Nobel prize in economic science. But it’s also famous because, despite not being perfect and there being alternative models, it remains relevant and a basis for asset pricing and portfolio allocation to this day. The CAPM model also provides an answer to the question: which portfolio on the efficient frontier should an investor buy (or at least mix with the riskless asset in an optimal portfolio?) The answer is the portfolio on the efficient frontier where a line from the riskless asset is tangent to the frontier. This portfolio is called the market portfolio, and should generally be combined with the riskless asset to create the lowest-risk, highest-return combination available. Modern Portfolio Theory (MPT), a topic we will discuss later in the semester, is based on the CAPM. The equity risk premium is the return an investor should expect to receive from an equity asset (like stocks) to compensate for the extra risk associated with holding an equity asset. Assuming US Treasury bills approximate the risk-free asset, then the equity premium for a market bundle of equity assets (say an S&P500 ETF) is the return to the index less the return to the T-bill. 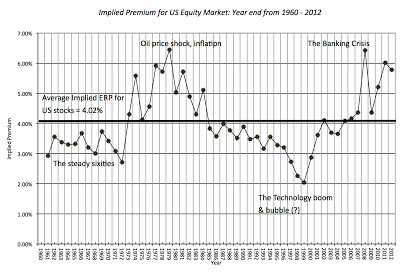 Historically, the equity risk premium (ERP) in the US has been around 5% (last 100 years–even though the exact value is highly debated). But the ERP isn’t stable, and varies from period to period. (See this plot of the ERP over the last 50 years to see how it varies.) It tends to be larger in bad economic times, and smaller in good times. It also appears to be smaller now-days than in past periods. The ERP is actually based on the expected return on equities, not the actual return. Looking forward, how much extra (above the riskless rate) do investors have to earn in order to hold equities? There might be a difference between the ex ante (in advance) ERP, and the realized returns on equities over Treasuries. This article in the The Economist talks about these differences. Why is the ERP important? Because many pension funds, especially those for public sector employees (state and federal government) use an assumed return on investment of around 8% per year to make them financially viable. Each year that the actual return is lower than this, the fund accrues more “unfunded liabilities.” These are promises made to employees about future benefits for which there is no source of funding currently. The ERP is also important because it is much higher than standard Expected Utility Theory models of risk attitudes would predict. A risk premium of 5% implies that people are incredibly risk averse, which their other behaviors suggest they are not. Prospect Theory has been applied to try to explain the ERP, but the explanations are not completely convincing. 1. An interesting blog post comparing how the US risk-return tradeoff has changed from 2003 to recent times. 2. An Investopedia entry on the efficiency frontier called the Optimal Portfolio. 5. Investopedia entry on ERP. Write a one page, typed (single spacing is fine) essay on Jensen’s alpha. What is it, how is it measured, and what use is it? Note: Why this topic for the homework? Last week I asked you to investigate Beta. Beta is an important component of the CAPM, and tells you about specific-asset relative risk. Jensen’s alpha is also related to CAPM, and beta, but measures something different. We will come back to it later in the course when we talk about portfolio strategies and performance. Then discuss the following proposition: “Every optimal portfolio should contain some amount of the riskless asset.” Provide evidence to support your position on this claim. 3. This week’s topic is pretty theoretical, but it highlights a pretty basic economic principle: efficiency. One common criticism of economics is that we talk too much about efficiency which is just unrealistic. Reflecting on the topic of the efficiency frontier (choosing optimal portfolios) do you think most investors deliberately try to reach the frontier, or don’t they care? Should they care? Is an efficient investor a better investor?